An oro-nasal fistula is when the oral cavity (mouth) communicates directly with the nasal cavity (nasal passages). Food and other debris such as hair get lodged into the nasal passages and infection developes leading to sneezing and nasal discharge. Treatment requires surgery. These are very challenging lesions to close and sometimes need more than one surgery. How the hole is repaired depends on where it is and how big it is and the available tissue surrounding it. It is very important to have a good blood supply. A thorough understanding of the anatomy of the area is needed – which structures such as blood vessels and nerves to avoid and the possible complications that can occur – therefore the surgeon needs advanced training to do these. The oro-nasal fistula in the above patient was treated with one surgery. He was an excellent patient with very dedicated owners. 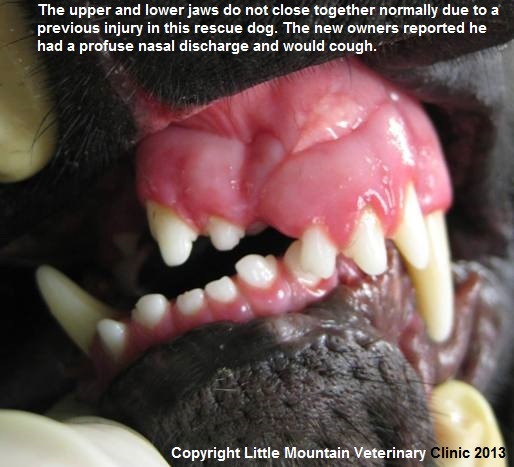 Prior to the surgery he was sneezing and ropes of thick infected nasal discharge came from his nose. He was lethargic and not feeling well. This cleared up following surgery. His energy came back and he wanted to play more.